Yesterday, I took an early afternoon stroll to enjoy my cloudy afternoon at Wood Hall for a performance of Wolf Trek: Alone In The Woods. I wasn’t sure what to expect from the show. I knew the show was a monologue about Kevin Kennedy’s experience in Wood Buffalo National Park and that he currently lives in Whitehorse. What I didn’t know is that Kevin Kennedy is a fantastic storyteller. His ability to tell the audience his story in a conversational manner while still maintaining a “fourth wall” stole the show for me. He wove his adventure in the Arctic with stories from his life. What was amazing to me was that although the story itself follows his journey, it also speaks on a more basic level about humanity and it’s connection with nature. Kevin Kennedy is a regular guy just like everybody else (of course he is unique in his own ways), but that fact really brought the audience closer to him and allowed us to really connect with him. His show isn’t preachy about humanity’s disconnect with nature but brings up an important point about how we should take a second and notice the disconnect. Kennedy is a wonderful performer and I think everyone could gain something from listening to his story. I followed up Wolf Trek with Flying Pig Puppet Company’s Folie A Deux. The show tells the story of identical twins dealing with mental illness through puppetry. One of the sisters, Violet, suffers from mental illness while the other, Rose, experiences folie a deux when she becomes very close with her sister. What I did enjoy about the show was the puppets themselves. They were so wonderfully designed and crafted in such a way that suspended the audience’s disbelief perfectly. I was continuously reminded of the film Labyrinth throughout the show. However, the story itself is rather disturbing with no real hope for any of the characters. It is defined as a tragedy and so I wouldn’t recommend this show to anyone who isn’t ready to delve into a frightening look into this rare illness. I left the play unable to shake the disturbing nature of the story, but overall the puppets were quite charming in themselves. Tonight, I am excited to spend my evening at the Downtown Activity Centre with Ionesco’s “The Lesson,” Cats or Babies, and Richard Tyrone Jone’s Big Heart. 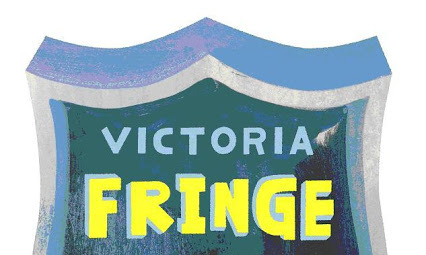 Happy Fringe!